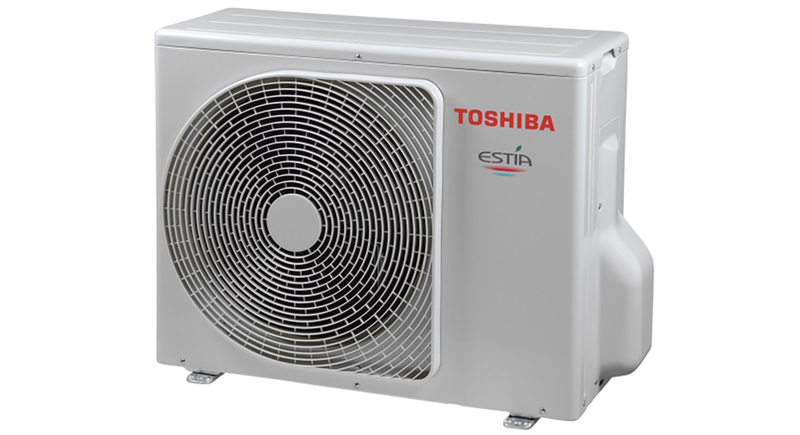 Toshiba has launched the ESTÍA 5 series air-to-water heat pump. With best-in-class CoP ratings across a broad range that covers Split solutions from 4 to 16kW and Monobloc from 16 to 21kW, the new ESTÍA air-to-water heat pump will bring highly efficient and low-cost space heating, hot water and summertime cooling to new homes or renovations as well as small-commercial properties. ESTÍA can replace or complement traditional boilers and will equally work with all types of heating emitters, delivering hot water temperatures up to 55°C. Most importantly, the eco-friendly ESTÍA brings peace of mind and security for energy conscious users and takes advantage of numerous European heat pump financial incentive schemes. The new and improved range represents the fifth ESTÍA generation and follows 10 years of successful continued air-to-water heat pump product development. Toshiba’s twin-rotary compressor and Intelligent Power Drive Unit (IPDU) inverter technology precisely maintains heating and cooling capacity with high energy efficiency at all times, especially at part load use, and ensures long-term reliability. The new 4.5kW outdoor unit for the ESTÍA Split demonstrates outstanding performances in the most compact chassis on the market. Impressive performance is achievable even at very low ambient temperatures. The world-leading ESTÍA Split offers energy efficiency with A++ ratings in space and combination heating. Its maximum COP of 4.90 at an air temperature of +7°C and 3.01 at -7°C represents true class leading performance. The unit can provide heating at outside temperatures down to -25°C, and domestic hot water from +40°C to +75°C. Part load efficiency (ηs) is up to 163% which exceeds the latest European Commission KPI whilst master/slave control of up to 8 units is possible. Flexibility is key for the ESTÍA Split solution. 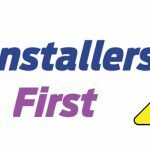 Comprising an outside unit, hydro module and water tank, installation is straightforward with no need for flue or underground captors requiring additional site work. The compact outdoor unit can be located on any convenient exterior wall thanks to extensive piping options. The Split solution is equally suited to new installations or as economic upgrades to replace existing systems. It can also work alongside traditional boilers as part of hybrid systems that optimise energy use. 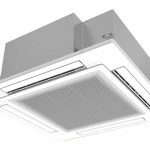 All types of heating and cooling emitters are accommodated including existing low temperature radiators, underfloor heating systems and fan coil units. Similarly with temperature control, traditional or new generation thermostats including PC and smartphone applications all integrate seamlessly. The ESTÍA Split hydro unit features a high-efficiency heat exchanger and a backup electric heater with optional kW ratings to provide further support in extreme conditions. Through the advanced control system, the hydro unit operates synchronously with the stainless steel hot water storage tank’s electrically powered heater, maintaining constant temperature levels and guaranteeing reduced running costs. 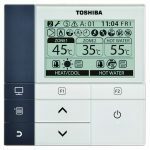 A new attractive and easy-to-use large screen remote controller manages a weekly timer with up to 10 programmable actions per day for heating in one or two zones in addition to hot water temperature levels. With its advanced built-in software the controller collects and analyses sensor data to optimise energy consumption through precise regulation. By utilising the ESTÍA´s electric heating capability, a one-touch temperature boost function quickly provides additional hot water. Other comfort and economy functions include a night mode that maintains a lower water temperature at pre-set times and a quiet mode that reduces the sound level of the outdoor unit by -7 dB(A) during nightfall hours. Safety features include an anti-bacteria control function that increases domestic hot water temperature to +75°C for 30 minutes on a pre-set regularly timed basis whilst integral frost protection prevents freezing in ice-susceptible temperatures. For larger installations and those requiring higher water temperatures, the ESTÍA Monobloc solution is rated A+ in space heating and also returns a best-in-class COP of 4.10 at an air temperature of +7°C and 2.51 at -7°C. The system provides direct hot water production up to 60°C down to -10°C outdoor temperature, and heating at outdoor temperatures down to -20°C. Part load efficiency (ɳs) is up to 144%. With up to 4 units controlled in a master/slave group, the ESTÍA Monobloc offers great potential as part of building management systems (BMS) through compatibility with most standard communications protocols. Jbus and Modbus are native protocols while BACnet & LON gateways are available as factory options. As a self-contained solution with all hydraulic components integrated, installation time and effort is significantly reduced and additionally the Monobloc version offers a number flexible options that help the installer maximise its application potential and minimise cost for new buildings or for larger renovation projects. Hydro modules can be supplied with either a variable speed pump with adjustable constant speed/ ΔT, a choice of a fixed speed pump with ESP up to 150kPa, or no pump where a pump is already installed on-site for existing projects. The installer can also choose to set a constant hot water temperature setpoint or use the heating auto curve control which automatically sets the target hot water temperature based on the outdoor conditions. This feature harnesses the full power of Toshiba´s advanced vector inverter control, optimising the system´s energy consumption and is especially relevant when compared to units that inefficiently heat water to maximum fixed temperatures at all times of the year. An intuitive simple-to-use remote control unit provides timer and set-up functions for two zones and hot water management. With its best in class performance with low energy consumption, the new ESTÍA 5 series air-to-water heat pump solutions represent the very latest in renewable energy technology. Through independent use and especially in line with European heat incentive schemes they offer significant energy savings for householders, communities and businesses.